Aggregate of Topaz crystals with very well defined faces and edges. They are colorless, transparent and bright and are on a matrix with Arsenopyrite and Quartz crystals. 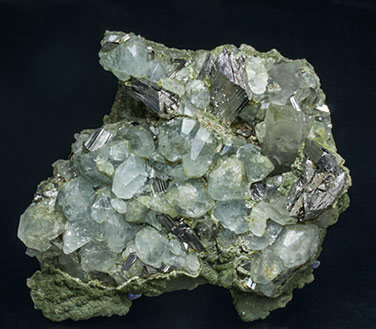 The sample has the whole back coated by chlorite, with Fluorite crystals. The upper levels of Panasqueira are currently offering surprising and pleasant novelties, with samples that are different from what is already known.